Bring home the thrill of the escape room with Spy Code – Operation: Escape Room. Choose a teammate to wear the escape belt and work together to free them. This exciting game has players collect three keys in challenges of skill, strategy and luck, before time runs out. Test your spy skills and problem-solving nerve with three tasks deigned to make players work as a team. The strategy challenge has players complete mathematical puzzles, find patterns and solve problems to crack the code. The skill challenge tests your ability to navigate a maze, while the luck challenge leaves it all up to chance. Completing each challenge earns you one of the three keys you need to release your teammate. Spy Code – Operation: Escape Room lets players choose from different levels of difficulty to ramp up the challenge, or adapt play for younger and older kids. 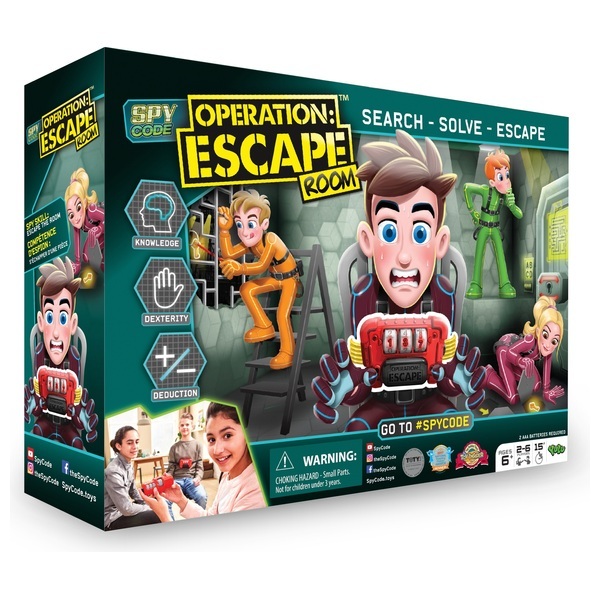 Get ready for spy kid adventures with a master timer, a skill challenge with 2 sticks, a strategy challenge with 45 plaing cards, a luck challenge, 3 keys and a set of rules to help you navigate the challenges in Spy Code – Operation: Escape Room.